Living with Depression and How to Beat Anxiety|Acceptance|Seriously, Has Denial Really Worked? 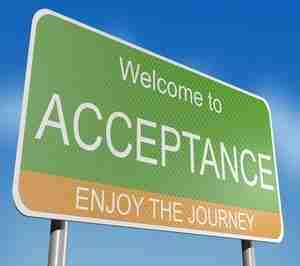 Acceptance: Seriously, Has Denial Really Worked? Sure seems like that’s what it comes down to for tens of millions all over this planet. And if you feel so inclined, you wouldn’t be the first Chipur reader to utter similar words of marrow-deep pain and seeming resignation. After all, you may well be in survival mode as you’re living with depression and/or wondering how to beat anxiety. I ought to know – yes, I’ve been there. Well, I kind of figured I’d elevate some blood pressure readings. So let’s see what I can offer in the way of antihypertensives. Go with me here. Let’s say you picked-up a nasty bug, which generated a high fever. You ache, you’re sweating like a fountain, your face is red, and coming up with any notion of life-worthiness ain’t happening. In your mind, resigning to the fever isn’t an option. But I say resignation – acceptance – is just what the doctor ordered, because it paves the highway to healing. Think about it – the very last thing your 103.5 degree worn and weary body needs is the stress of a struggle with immediate reality. News flash! It is what it is, and denial isn’t going to make it disappear. But, notice I’ve said nothing about giving-up. Of course you’re going to do all you can to knock-out the fever. I’m simply saying accepting its existence goes a long way toward quieting your mind – your body. And what better way to encourage healing? So let’s stroll on over to the mood and anxiety disorder side of the fence. Acceptance wields the same super-mighty power. And surely it keeps us from the tar pits of denial. Got to ask, has it really ever worked for the long-haul? Let me fire this by you. Could you ever learn to peacefully coexist with someone you detested if you denied her/his very existence? I certainly don’t see how. That being the case, how miserable does your life become as a result of acceptance being a foreign concept? Do you really want to live like that? Come on, isn’t it obvious that peace arrives – and stays – on the scene exclusively within the context of acceptance – even in the most turbulent of times? If living with depression and/or 24/7 pondering how to beat anxiety is a reality for you, invite acceptance into your mind and heart. Absolutely continue your relief and healing mission as you do whatever it is you do – therapy, lifestyle changes, meditation, guided imagery, meds. Truly, the only tweak here is kicking denial to the curb and turning to acceptance. Never forget, you don’t have to love your present circumstances, and reality can be a booger. However, accepting that reality sure beats the heck out of the wear and tear of wrestling with the truth, day-in and day-out. Oh, one last thought. How could you ever hope to remedy your depression or anxiety if, in your mind, they don’t exist? Are you super-hungry for relief and healing? Reach into the Chipur articles cookie jar. You’re bound to find something yummy and satisfying. Next Post: Kava, the Anxiety Slayer? New Research Says Yes!